Monday - plain read through of the story. I have found that just reading it the first day and then putting it away sparks my children's interest. They are even starting to think of things they might want to do on day two! Tuesday - read the story again. This time I pointed out the quilts in the story and made a special notice of the Joseph's Coat of Many Colors pattern. My son then colored some quilt squares from the FIAR teacher's guide to put in his folder. I also talked to GMan about what goes on in coal mines. I wanted to go more in depth about mining, but we just ran out of time. Wednesday - This day I got out a Grandmother's Quilt that was made by my husband's grandmother and let the children snuggle in it while we read. I gave my son four vocabulary cards and he had to listen for those words while we read. (his favorite word was MURMUR... he takes great pride in murmuring now and seeing how many times that word is used in our other read alouds! We talked about the quilt extensively, and looked at other handmade quilts we have in our house. We also looked at the illustrations in the book and discussed how the use of muted colors set the tone of the story. Thursday - We read the story again, and focused today on the fact that it takes place in the Appalachian Mountains. We located them on a map and then I pointed out things in the story that would make it typically "Appalachian" - log cabins, folk instruments, poverty, etc... My children related to this since we live very close to the Appalachians. I chose to pick out the dulcimer (it hangs on the wall in one illustration) and we researched it, made it one of our spelling words, and listened to clips on YouTube. We saw two different dulcimers... the hammered dulcimer and traditional mountain dulcimer. I think we spent almost an hour at the computer watching different videos - it was so interesting. Friday - More music with the story today! We read the book, and then I taught my children a folk song from Appalachia, "The Riddle Song" . I found sheet music here along with a nice lesson plan. If you don't play piano or guitar, we also found another video of a woman playing the song on the dulcimer - how cool is that? Even just printing the lyrics to the "The Riddle Song" and reading them is fun - it really is a riddle that kids enjoy. As with all Five In A Row Stories, my older child tagged along in learning about it as well. The stories all have such an appeal to every age level, which is such a gift to us all. This post in linked to the Hip Homeschool Hop. 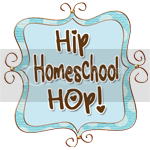 Stop by and see what other homeschoolers are doing this week!